It’s a Given Ron Burgundy Shows Up on SNL This Week, Right? I wrote yesterday how the world is on the brink of Ron Burgundy overload. Every time you turn on a late night talk show or commercial, there he is, mispronouncing words or having a staring contest with a horse. 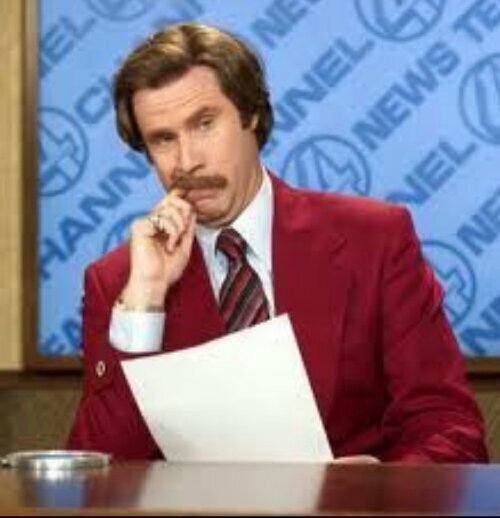 I’d be happy if Ron Burgundy went away for a few weeks, and then reemerged Christmas morning for the whole world to see on the big screen. Well, maybe not disappear completely. This Saturday Paul Rudd (Brian Fantana) is hosting Saturday Night Live. I fully expect Rudd to plug the new Anchorman movie, which has already proved it’s willing to promote itself in any way possible. My question is this: is it possible to reference Anchorman without including the movie’s leading man, who also happens to be one of SNL’s most notable alumni? Since we were forced to sit through all those Dodge commercials, the least Ferrell can do is reward us with a Ron Burgundy performance at studio 8H. A Sean Connery celebrity jeopardy wouldn’t hurt, either. Posted on December 3, 2013, in Average Blog Posts and tagged anchorman, ferrell, host, live, night, paul, Rudd, Saturday, snl, Will. Bookmark the permalink. Leave a comment.